Lean NFV Ops: back from IDF15. “In this panel our guests will discuss key issues facing orchestration providers, including the standardization efforts for descriptors and information models, intelligent workload placement options with Intel architecture, and operator priorities for NFV-O and MANO in 2016” – Intel Network Builders Summit. San Francisco, August 17, 1:30 pm. From left to right: Jose de Francisco, Ted East, Bob Haddlenton, Valerie Noto. Alcatel-Lucent’s Lean NFV Ops Demo Station at IDF15. The Lean NFV Ops Roadshow is back after a short summer break. 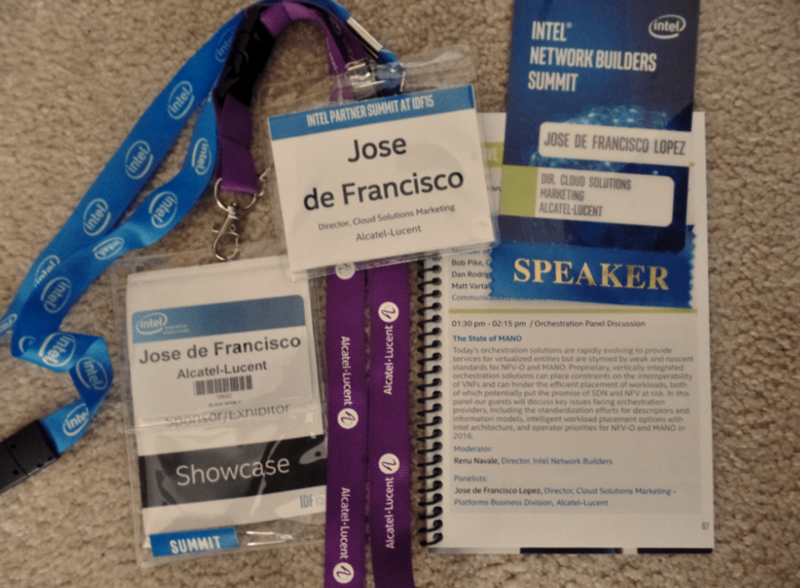 Our team would like to thank Intel for inviting us to join Network Builders Summit, Partner Summit, and the prominent Developer Forum (IDF15) this past week in San Francisco. The above pictures were taken at Alcatel-Lucent’s station, which featured a live interactive demonstration. See my earlier post “Gearing for IDF15” for more information on that. Long story short, IDF15 attendees were able to have fun by testing our Lean NFV Ops system when playing this game, which is designed to create catastrophic failures. On a serious note, the higher the game’s score the more critical the issues experienced. This exemplified zero touch healing and recovery executed in real time to sustain a High Availability (HA) environment. In these pictures you can see Intel’s Diane Bryant, SVP/GM Data Center Group, and Sandra Rivera, VP/GM Network Platforms Groups, putting our demo to the test. I would also like to thank Renu Navale who moderated “The State of Management & Orchestration”, a panel discussion where I joined Ciena’s Recep Ozdag, Overture’s Scott Vandiver and Rift.io’s Tony Schoener in a fairly engaging discussion. We discussed opportunities and challenges involving ETSI NFV’s Management & Orchestration (MANO) architecture, standardization efforts across the board, information models and enhanced platform awareness (EPA) among other topics. There were 50+ people attending this session. Those providing feedback on this session mentioned that topics and viewpoints expressed there were followed with interest. My understanding is that the video will be available in a couple of weeks. Regarding questions on the underlying fundamentals behind Lean NFV Ops: this link provides a brief paper on the topic just to begin with. Generally speaking, “Lean” practices couple (a) effective quality management with (b) efficient end-to-end systems. That summarizes Lean’s paradigm across any industry we happen to look into, whether we are talking about manufacturing, services or software for that matter. Our conversation on Lean NFV Ops has been well received since first presented this at Mobile World Congress earlier in the year. Proven interest has to do with addressing quality by discussing Reliability, Availability and Serviceability (RAS) and Quality of Experience (QoE) in the telecommunications context. These are critical success factors in an industry concerned with a carrier grade tradition facing which is now conflicting views when confronted with with compelling cloud economics. I created the above chart on Lean NFV Ops to clearly show that we are optimizing for both Service Level (SLA) and Return on Asset (ROA) since High Availability (HA) and High Utilization levels shape dynamic network behaviors. Simply put, Lean NFV Ops is abut effectively delivering timely “service(s) of value” by operating at “resource efficient levels”. Making a return on the Communication Service Provider (CSP) investments (ROI) in NFV depends on achieving that. Otherwise, virtualization critics will keep reasonably doubting the need for any changes. Equally important, sustaining a competitive advantage means that early implementations can be based on nimble architectures, which remain streamlined (and, therefore, stay lean vs. becoming bloated and over-engineered) as they rapidly change scale and/or scope. With that in mind, embracing Lean NFV Ops’ agile “continuous improvement” and making room for incremental innovation happen to be of the essence. One more thought, Lean NFV Ops is not about a mechanical one to one implementation of known Lean principles. This conversation is centered on understanding the nature of the telecommunications sector so that we can come down to defining “how-to” guiding principles. Lean \ˈlēn\ adjective: athletic, strong and healthy, absence of excess. All running on CloudBand 3.0, the platform discussed in this interview. 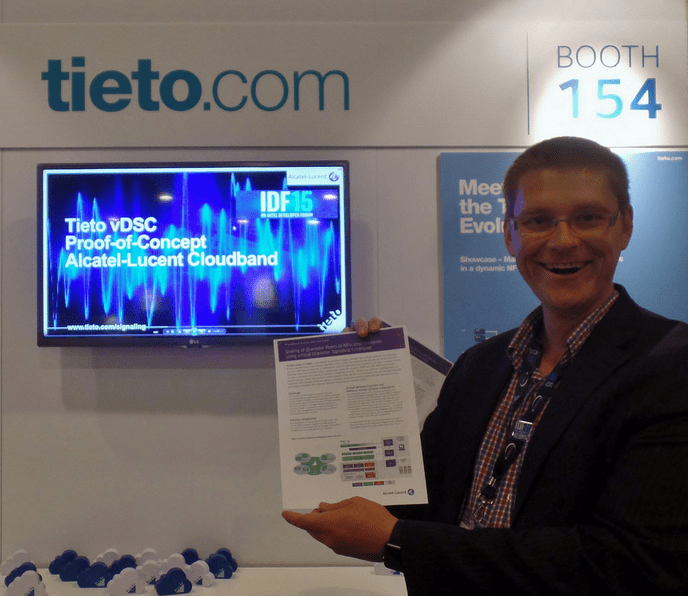 Tieto, a CloudBand Ecosystem Member, was also present at IDF’s Network Builders zone. Tieto’s team had onboarded a VNF on our platform and Daniel Nilson was kind enough to share his latest paper. I would like to take this chance to give Ted East and our Cloud Innovation Center (CIC) team “kudos” to acknowledge the hard work going into all the timely system upgrades, which continue to make the Lean NFV Ops live demonstration an invaluable asset (WAM’s latest retrofit included : ) Last but not least, thanks to Andreas, Asaf, Debbie, Erez, Guy, Ken, Phil and Val for all the couching and guidance when preparing for IDF. Click above to access this album on Flickr. Lean NFV Ops: Gearing for Intel Developers Forum 2015. Lean NFV Ops at Intel’s Data Center Day.